Cochon 555, a culinary competition and tasting event celebrating heritage breed pigs, returns to Boston this year. The event is Sunday March 25, 2012 at 5 pm at the Mandarin Oriental Boston. WHAT: Cochon 555 – five chefs, five pigs, five winemakers – is a one-of-a-kind traveling culinary competition and tasting event to promote sustainable farming of heritage breed pigs. Cochon 555 Boston, presented by Infiniti and media partner Boston Magazine, will challenge five local chefs to prepare a menu created from heritage breed pigs, nose-to-tail, for an audience of pork-loving epicureans. WHO: 2012 Boston competing chefs include Jamie Bissonette of Coppa and Toro, Tim Cushman of O Ya, Barbara Lynch of Menton, Barry Maiden of Hungry Mother, and Steve "Nookie" Postal of Fenway Park. DETAILS: Guests will be treated to a epic pork feast of five whole heritage pigs prepared by five chefs and wines from five family wineries, including Buty Winery, Elk Cove Vineyards, Syncline Wines, Sokol Blosser, Chehalem Wines, and K Vintners. The evening will also include wines by SALDO, an interactive tasting contest with Matt Jennings of Farmstead and Le Creuset, Anchor Brew, tastings of ChinacoTequila and the "Perfect Manhattan" Cochon 555 Bar with Daniel Hyatt of Alembic featuring five craft American spirits, and Domaine Serene of Oregon paired with Iberico De Bellota by Fermin. Joshua Smith from TICO will host a Heritage BBQ whole hog family meal after the completion of the voting. The night will conclude with a special 25th anniversary champagne toast to the James Beard Foundation, sponsored by Laurent-Perrier Champagne, now celebrating its 200th year; and dessert samples of exclusive chocolate bar flavors from Xocolatl de David, paired with cold-brew Safari Cup Coffee. At the end of the night, attendees and local judges will select the Prince or Princess of Porc. The winning chef will go on to compete against other regional winners at the finale Grand Cochon event at the FOOD & WINE Classic in Aspen, June 17, 2012. TICKETS: $125 per person for general admission; $200 for VIP, which includes one hour early access to sample dishes from three of the competing chef stations, welcome cocktails from The King's Ginger, artisan cheeses from Formaggio Kitchen and Murray'sCheese, and Island Creek Oysters. Here's another one of those things I come across and think "man, this is targeted right at me!" It's no secret I've gotten stuck (in a good way) on California Pinot Noir. Every time I stray into other categories and taste a wine I'm not thrilled with I scurry back to my comfort zone. PinotReport focuses its coverage on Western Pinot Noir - which translates to mostly new world wines outside of Pinot Noir's traditional home of Burgundy. The publication is put out by former Wine Spectator Senior Editor and President Gregory Walter who lives in Sonoma. His coverage of nearby producers is extensive, but he also devotes time to Oregon, New Zealand, and other areas known for Pinot Noir production. Seeing that there was a publication out there devoted exclusively to new world Pinot Noir was intriguing to me. Unlike other categories it's not exactly clear which professional critic's voice is most authoritative in new world Pinot Noir. I follow James Laube from Wine Spectator closely, but he only covers California Pinot Noir and has a lot of other categories to cover as well. Harvey Steiman covers Oregon Pinot Noir for Spectator, and has turned me on to a lot of great values, but Oregon Pinot Noir has been disappointing to me. I always looked at Robert Parker's reviews of Pinot Noir as half-hearted. As in: If it's outside of Bordeaux, Chateauneuf-du-Pape and Napa, it's second tier. Antonio Galloni has picked up coverage of California Pinot Noir along with seemingly everything else for Wine Advocate so I doubt he'll have much time to focus on the category. Burghound does cover California Pinot Noir but I'm predisposed to suspect it's through the lense of how well it exudes Burgundian character. The Prince of Pinot looks promising even though he doesn't score wines. I'll have to take a closer look at each of these. But PinotReport is uniquely positioned in this space. I reached out to Gregory last fall and asked for a trial subscription for the purposes of writing this review and I've been following along with new issues since. Each issue starts with opening thoughts which usually focus on the current vintage or the state of the Western Pinot Noir market at large. The bulk of the content follows a format that should be familiar to Wine Advocate readers whereby the winery's story is told along with some editorial thoughts on the quality of the current releases. Tasting notes for each wine reviewed along with prices and numerical scores on a 100 point scale follow. A typical issue is around 10 pages long and features wines from a half dozen producers. New issues are published about once a month. I'm a big believer in blind tasting so it's encouraging to read that "All wines were tasted blind and scored before knowing anything other than that the general region they were from." I think this is particularly important when assessing various bottlings from a given producer. If any reviewer is presented wines in ascending price order I can't help but think they're going to be predisposed to liking the more expensive wines more. Medium-deep ruby color; deep, earthy cherry and spice aromas; deep, complex cherry flavors with many layers of spice, anise and earth notes; silky texture; great structure and balance; long finish. Complex and many-layered Pinot that is a testament to the fact that an appellation blend in the hands of the right winemaker can as good or better than a vineyard designate. Print and online subscriptions are available. Each new issue is announced online with an email to subscribers which contains a link to download the content as a PDF. Back issues are also available for download. Search capabilities could be better, but full PinotReport tasting notes are available on CellarTracker under Professional Reviews for subscribers. I'd love to see the content delivered as a gorgeous interactive eBook. I always enjoy reading the latest issue of Spectator with a glass of wine. I'd like to extend that experience to other publications but a PDF doesn't quite have the same feel as a glossy magazine. Maybe reading it on an iPad would help (I don't yet own one but I'm tempted). Walter's enthusiasm for the subject is evident which in turn makes reading each newsletter enjoyable. He has a wealth of knowledge yet never talks down to the reader. My sample size is small but I think he tends to be more generous with the big scores than some other critics. Once you account for that his palate seems very well calibrated with mine. Your mileage may vary of course! Overall I'd rate PinotReport 92 points. Content so laser focused it's hard not to like. Expertise and experience on the subject delivered in a warm likeable tone. I get the feeling it would be a ton of fun to go wine tasting through Sonoma with Greg, and I think PinotReport provides a window into what that would be like. Question of the Day: Who is your most trusted source of new world Pinot Noir reviews? Radio-Coteau (rā’ dē ō - kō tō’) adj. A colloquial expression suggesting “word of mouth.” Region: Northern Rhone. Literal Translation: broadcasting from the hillside. I can't say for sure where I first heard of Radio-Coteau but I'm glad I did. It may have been @DrncPno on Twitter that planted the first seed which in turn encouraged me to buy a bottle of their 2006 La Neblina Pinot Noir. Paired with a simple mushroom pizza on a Friday night that wine was simply amazing. Not an off note in the bottle. Purely delicious. Their focus is on Pinot Noir from the North Coast of California (Sonoma Coast, Russian River Valley, Anderson Valley). They also produce Chardonnay and Syrah. Their wines sell in the $40-$55 range which is one of the things I love about California Pinot Noir: You can buy wines from top producers at entry-level Napa Cab prices. Stylistically, I think their wines are similar to Dehlinger's: Balanced and pure yet unabashedly new world. Proprietor Eric Sussman spent time as an associate winemaker at Dehlinger - as I learned in this excellent informative piece from Terroirist - so perhaps the similarities are more than coincidental. Both Dehlinger and Radio-Coteau produce Pinot Noirs with Goldridge fruit. Their 2010s are just being released to mailing list members. Like other Sonoma Pinot producers they're saying the vintage was challenging but successful. In general I'm buying 2010 California Pinot Noir, but trying to be selective. 2009 was a tremendous vintage and there's still inventory around. And there's always another great vintage right around the corner. For more information on Radio-Coteau visit their website and sign up for their mailing list. You can occasionally find their wines at retail as well. Question of the Day: Have you tried Radio-Coteau? If so what did you think? If not, what are some California Pinot Noir mailing lists you'd recommend? Here come the 2009 Napa Cabs. In general, the pros are expecting 2009 to continue a string of outstanding vintages from Napa. With the exception of 2007 (which was exceptionally good) 2005-2009 are all outstanding Napa Cab vintages which elude quick bookmarking as being universally better or worse than one or another. Look for wineries whose style you enjoy and 2009 will likely satisfy. The deal hounds among us have discovered HALL Wines' Napa Valley bottling as a reliable one worth seeking out. In the $40 range it's not cheap but it can run with the big boys costing $50-$80. "At HALL Wines we offer an elegant and stylish approach to the wine experience that combines the art of winemaking, design and contemporary art," says owner and vintner Kathryn Hall. In 2009 their winery in St. Helena was the first in California to receive Gold LEED Certification. In 2010 their vineyards were certified organic. Last year, their 2008 Kathryn Hall Cabernet Sauvignon ($90) received a 96 point rating and landed on the number two spot on Wine Spectator's Top 100 list. The Kathryn Hall and Napa Valley bottlings are often confused. Remember that the white labeled wines are from their Napa Valley series and cost between $38 and $50 at retail. The Kathryn Hall bottling has a red label and sells for at least $70 and up at retail. I saw a guy at Costco last year filling his shopping cart with the white labeled Napa Valley bottling whispering to me (incorrectly) that it was Wine Spectator's #2 Wine of the Year. Not that the Napa Valley isn't a fantastic bottle of wine - just a word of caution be familiar with the bottlings in their lineup. "This is a thrilling set of wines from Hall. The estate favors a rich, extroverted style, yet all of these wines have distinct personalities and tons of sheer character. ... Simply put, I was blown away by what I tasted." 100% opaque - mostly purple with ruby red in the background. Bright, high toned and fresh with lively fruit. Grippy mouth feel with cinammon and blackberries on the nose. On the palate I get coconut rum and cola. Needs time to settle down but I like what I see. Look for Laube's rating (Spectator) to fall in the 90-93 range and continue a nice run for this Napa Valley bottling. Visit the HALL Wines website to learn more - they ship 6 or more bottles for just $1 and offer nice deals to club members. Question of the Day: Have you tried HALL Wines lately? If so, what did you think? Here's another one of those offers I feel is laser-targeted at me: Blue Ginger in Wellesley is hosting a dinner featuring Honig wines. I say laser-targeted because I love Honig's wines and I love Blue Ginger. Honig is a Napa producer of a freaking delicious Sauvignon Blanc, a Napa value benchmark Cabernet, and a spot-on higher end Cabernet bottling (Bartolucci). I enjoy the style of their wines year in and year out and they deliver value across everything they produce. 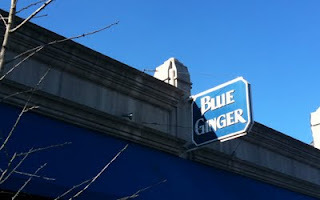 Blue Ginger is hands down our favorite restaurant in town. They always seem to deliver a good time whether you sit in the lounge, sit down for dinner, or attend a wine event. Oh my what a delicious wine. If you're looking for a wine to share with guests who don't usually drink wine I think you might find them guzzling this one with delight. And for guests that do drink wine, if they're not adverse to a little fruit-forward, slight sweetness to their wine I think they'd appreciate this one too. If we take Kim Crawford Sauvignon Blanc as the baseline for new world SB and subtract the edgy zingy pungent aromatics and replace it with new world tropical goodness- I think you have this wine. Garys', Rosella's, Pisoni... While exploring top California Pinot Noir producers you'll inevitably bump into a short list of vineyards that supply folks like Kosta Browne, Loring, Siduri, A.P. Vin, and Miner with grapes. When you dig a little deeper you'll find that Gary and Rosella Franscioni are the owners of these vineyards and they produce wine under their own label: Roar. The vineyards are within the Santa Lucia Highlands AVA in Monterey County California, which has become one of my favorite regions for Pinot Noir. The Russian River Valley, Anderson Valley, and the Sonoma Coast are up there too, but I'm really enjoying the bold fruit-forward Pinot Noirs from SLH. The Franscionis have been farming in the area for over 100 years before getting into wine. They planted Rosella's Vineyard in 1996 then decided to make their own wine in 2001. It's amazing how quickly Pinot Noir quality has risen in California. 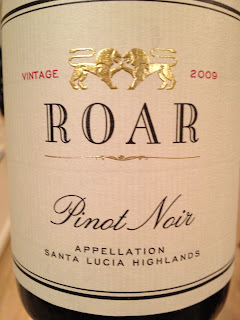 The name Roar comes from sound winds make as it tears through their vineyards. Roar recently released their Spring 2010 offer to folks on their mailing list. Their Pinots sell for $40-$50. The winemaker here is Ed Kurtzman (Freeman, August West, and his own label Sandler) with consultation from Adam Lee (Siduri). They also make Syrah and recently added Chardonnay to their lineup. Here are my thoughts on their 2009 appellation bottling. I had high hopes for this wine and it didn't disappoint. At all. Opened it to help decide whether to buy their 2010's and I think I will. It's ready to go immediately upon opening but boy does it reveal more with time. Each sip was better than the one before it. Tremendous. Started off as a very good/outstanding Santa Lucia Highlands Pinot Noir but evolved into much more. Brimming with incredibly ripe strawberries with supporting notes of dry kindling. Like imagine you're starting a campfire in the desert and you grab some mesquite and snap one open. Wow. But not doubt - the fruit dominates. It's just always followed up with enough savory complexity to keep it interesting. Unfined and unfiltered, and it shows at times with slight siltiness throughout and occasional rogue sediment. The mouthfeel is silky smooth and in keeping with its category. Long finish. Tremendous wine. Carries its price tag ($40) and then some. If it were an NFL running back it would be Barry Sanders - starts off looking like it's going to be just a solid effort and ends up breaking it wide open. So fun to watch it in action. Based on this experience I'll be buying their 2010s and looking forward to trying more of their wines. You can find them around at retail, but you've got to look around. 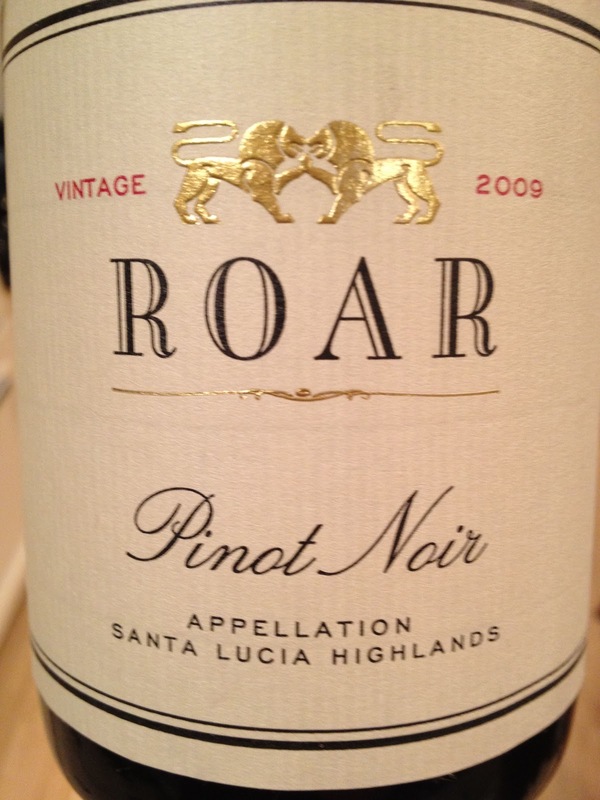 Question of the Day: Have you tried Roar Pinot Noir? If so what did you think? If not, what other producers in this category would your recommend? Taste of the Nation Boston 2012 is coming to the Hynes Convention Center Thursday, April 19th. The event features a chance to taste dishes from over 65 Boston restaurants, 100 different wines, specialty cocktails, craft beer, and a silent auction and live entertainment. Boston’s chefs and restaurants will participate alongside the event’s three Honorary Chef Chairs: Gordon Hamersley of Hamersley’s Bistro, Andy Husbands of Tremont 647, Jody Adams of Rialto, and Joanne Chang-Meyers of Flour Bakery. Use promotional code VDAY2012 for 20% off.